I made the bag using SU! 's Fancy Favor die - a quick and easy little giftie! I made the 3"x3" gift card and tag with the new Build-A-Bear Workshop set in the Holiday Mini - Beary Best Friends. I paper-pieced the dress with the same paper I used to make the bag, also part of the BABW goodies. These are such fun prints! The name of the dsp is Pawsitively Prints. If you know Enavi, you know that she loves anything sparkly. In fact, we just went shoe shopping for her this week and and picked out sparkly shoes. Every time we walk outside she says, "Do you see how my shoes sparkle in the sunlight?" LOL! 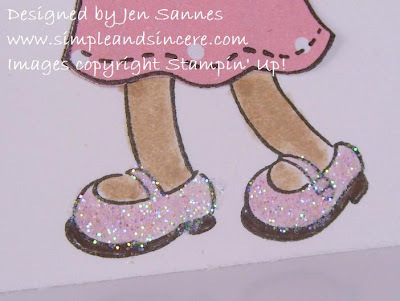 Anyway, I needed to add a little glitz to this girlie bear, so I added a touch of Dazzling Diamonds to her mary janes. Cute, huh? The inside of the card says "I [heart] you Beary Much! ", which is from the coordinating BABW set of phrases, called Beary Nice Wishes. I hope your Labor Day weekend is off to a great start. I'll be back on Sunday with my first card for the CAS design time. See you then! Oh, I love the glittery shoes! Darling...Yes, the sparkle on the shoes "makes" the project! Love it!